Use our new Magni Clear solar blankets to heat your pool faster. Our thermal pool blankets are laced with air bubbles that act as an insulating layer, shielding your pool from cool winds and nighttime cooling. 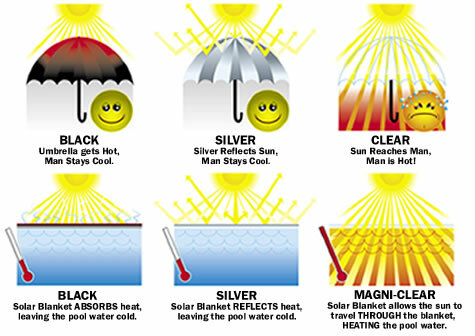 In addition, our clear swimming pool solar blankets allow more solar heat to reach the depths of your pool and heat it thoroughly. Our blankets are made of extra-thick 12 gauge material so they will outlast most other above-ground blankets on the market. They are backed by a 5 Year Prorated Manufacturer Warranty. Invest in the solar blanket that will give you the best heating you can buy MagniClear!